Our strategic position makes it possible to move in the old town on foot, alternatively. it is advisable to hire a bicycle nearby. In Trapani enjoy the "Couscous"! This is the famous cous cous of Arab origin flavored with the tasty fish. "Rianata" is typical pizza in Trapani consisting of oregano, garlic, percorino (cheese), tomatoes, anchovies, parsley and olive oil. You can find the recipes of typical dishes here. The room should be released within 10.30 a.m. Whether we love animals we can't accept pets. 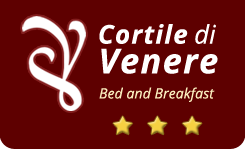 Breakfast from 08.00 a.m. to 10.00 a.m.
Book at the best price "Guaranteed"
B&B Cortile di Venere - Touring Group - Powered by Seonweb Web Agency in Trapani | Suggested: Hotel Trapani In, B&B Arco Antico, B&B La Giara.